Dangerous driving – especially involving impaired drivers – will be in the sights of Oregon police officers during the 78-hour Fourth of July holiday period starting 6:00 p.m., Thursday, July 3rd, through 11:59 p.m., Sunday, July 6th. High speed driving continues to also be a concern as reflected in last year’s Oregon State Police (OSP) enforcement toward drivers traveling 100 mph and faster that showed the highest number of incidents happen in the summer months. According to statistics provided by ODOT’s Fatality Analysis Reporting Unit (FARS), the Fourth of July holiday period is the deadliest holiday period of the year. Since 1970, FARS statistics show 286 fatalities have occurred during Oregon’s Independence Day holiday. Half of Oregon’s fatalities were in alcohol-involved crashes. Nationally, July 4th is the second deadliest day of the year on America’s roadways, mostly due to impaired driving. OSP Captain Gerry Gregg, director of the OSP Patrol Services Division, emphasized the department’s participation in OPERATION C.A.R.E. (Combined Accident Reduction Effort) through increased enforcement on those hazardous violations that are factors in traffic crashes on our nation’s highways including intoxicated, reckless, and fatigued driving. Extra OSP troopers, county deputies and city police officers will be working to increase enforcement and assistance using ODOT-provided overtime grant funds aimed at highway safety dangers. Oregon is also experiencing the highest volume of highway construction in more than 50 years. Work will pause for the holiday, but work zones will still be marked and will still require slower speeds. A recently completed OSP review of high speed enforcement during 2007 showed nearly half of the drivers cited for driving 100 mph or faster happened during May – August. Speeding drivers are a real concern and impact highway safety as excessive speed is a factor in half of all traffic fatalities, and the only factor in about 30 percent of these crashes in Oregon. Crash severity increases sharply with speeds in excess of 60 mph, and the probability of fatal injury increases sharply above 70 mph. The OSP enforcement review showed troopers cited 494 drivers for driving 100 mph or faster in 2007, a slight drop of nearly 8 percent of drivers cited in 2006. OSP enforcement statistics reflected increased citations in 70 – 79 mph and 80 – 89 mph speed ranges but slight decreases in the 90 – 99 mph and 100 mph plus categories. Three drivers recorded the highest OSP-cited speed of 139 mph, but in one case Morrow County Sheriff’s Office checked one driver at 153 mph on Interstate 84 that led to an attempt to elude from police before officers were able to spike a tire and bring the incident to a safe ending near Hermiston. OSP dispatch center reported driving complaints rose from 22,700 in 2000 to over 49,000 in 2007, an average of 135 per day and 5.6 per hour. In 2006, there were nearly 42,000 reported driving complaints. Since 2000, over 4,100 drivers have been cited for going 100 mph or faster. During calendar year 2007, DMV posted 428 court ordered suspensions for speeding while driving over 100 mph. This is an increase from the previous year when 405 suspensions were ordered by the court. Enforcement statistics reflected drops on Interstate and secondary state highways. 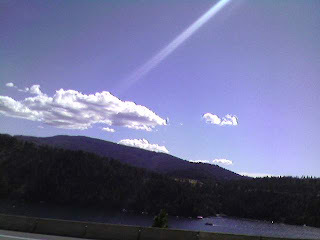 Interstate 5 had two sections with notable increases occurring from Oregon/California border to Grants Pass and Cottage Grove to Eugene. Interstate 84 had a notable increase in the section between Hood River and Biggs Junction, and a significant drop in the section between Baker City and Oregon/Idaho border. Highway 97 noted more than a 50 percent increase with nearly 60 % of these drivers cited in the section between Highway 58 and the Oregon/California border. Be watchful for emergency vehicles displaying required warning lights and using emergency equipment. Yield when required and maintain a safe distance when they are working on our highways. Get plenty of rest before starting out. Fatigued drivers are more frequent during holiday weekends because of increased travel and activity. Allow plenty of time to reach your destination. Expect the unexpected. Be informed and prepared when traveling on any of our highways. When traveling anywhere, plan ahead and take known routes if possible. For road conditions in Oregon, call 5-1-1 or (800) 977-ODOT (6368). Outside Oregon, dial (503) 588-2941. Visiting TripCheck.com on the Internet provides information on road and weather conditions, incidents and traffic delays, and links to numerous cameras along major routes. With nicer weather and rising gas prices, more motorcycles and bicycles are being used on our highways. Be on the lookout and keep from being distracted from your driving task. If considering a remote route that you have never traveled on, don’t hesitate to contact available road and weather condition phone number or Internet resources, or contact police or highway department officials. Be aware that many road construction projects are underway around the state. The scope of work zones is projected to continue to increase through implementation of the Oregon Transportation Improvement Act, the biggest overhaul and modernization of Oregon highways and bridges in decades. Even when workers are not present, all work zone speed limits still apply and fines double. Inactive work zones still have equipment, detours, and incomplete changes in the roadway so drivers need to slow down and be alert. Always use safety restraints and child safety seats correctly. All motorists play an important part in keeping our highways and city streets safe. Immediately report aggressive, dangerous and intoxicated drivers to the Oregon State Police at 1-800-24DRUNK (1-800-243-7865) or call 9-1-1. 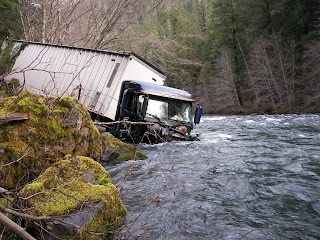 A commercial truck driver received serious injury Thursday morning after the truck he was driving left Highway 138E about 11 miles east of Steamboat and crashed into the North Umpqua River. An estimated 150 gallons of diesel fuel spilled into the river. According to Oregon State Police (OSP) Senior Trooper Jeff Willis, on April 10, 2008 at approximately 6:00 a.m. a truck and chip trailer operated by JUSTIN J. SHAFFER, age 36, from Dillard, was eastbound on Highway 138E near milepost 51 when, for an undetermined reason, it failed to negotiate a right curve and crossed the highway. The truck and trailer left the highway, traveled down a steep embankment and into the North Umpqua River. SHAFFER was seriously injured and transported by Air Life to St. Charles Medical Center in Bend. SHAFFER was driving for Terrain Tamers Chip Hauling, Inc. and the trailer was empty. An estimated 150 gallons of diesel fuel spilled into the river. ODOT Hazmat and First Strike Environmental of Roseburg responded to the scene to handle the diesel spill. OSP troopers from the Roseburg Area Command office are continuing the investigation. In addition to the mentioned agencies, local emergency responders also assisted at the scene. Department of Environmental Quality and Department of Fish and Wildlife were notified about the spill.